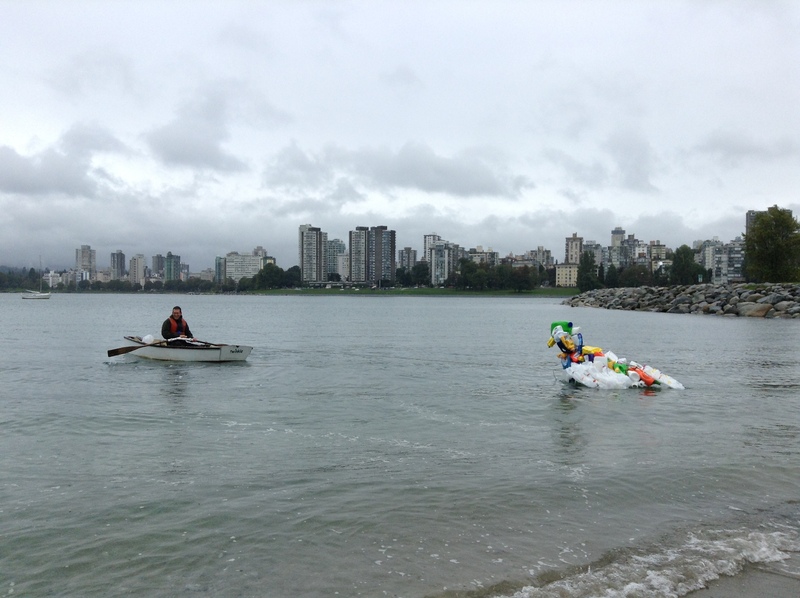 PETE, The PolyEthylene Bird, is a bit lower in the water but he’s afloat and moored to the hula hoop on the piling in Heritage Harbour. His beak is down – feeling a little sad not to have his friends around, or perhaps just looking for something to eat. Once these very blustery days are through for a while, we’ll organize a work party to go down and see what we can do to get him riding high again. Here are photos from the basement of the Vancouver Maritime Museum on the day before the Launch Date/Worldwide Bird Art Installation Day. 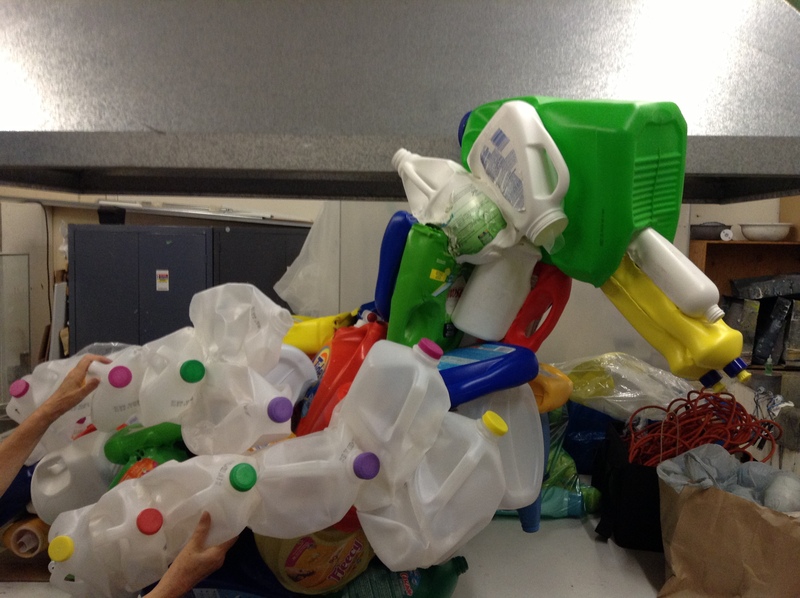 It’s been quite the time trying to make a large, floating bird art installation without using anything except #2 HDPE plastic so it can be recycled after the fact. Want to see PETE? 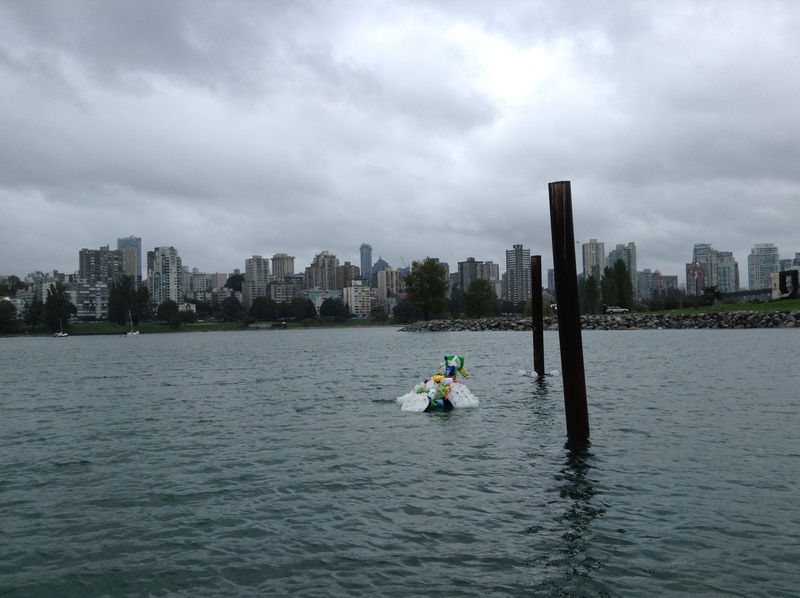 He’ll be at the Heritage Harbour, back of Vancouver Maritime Museum for the month of October. 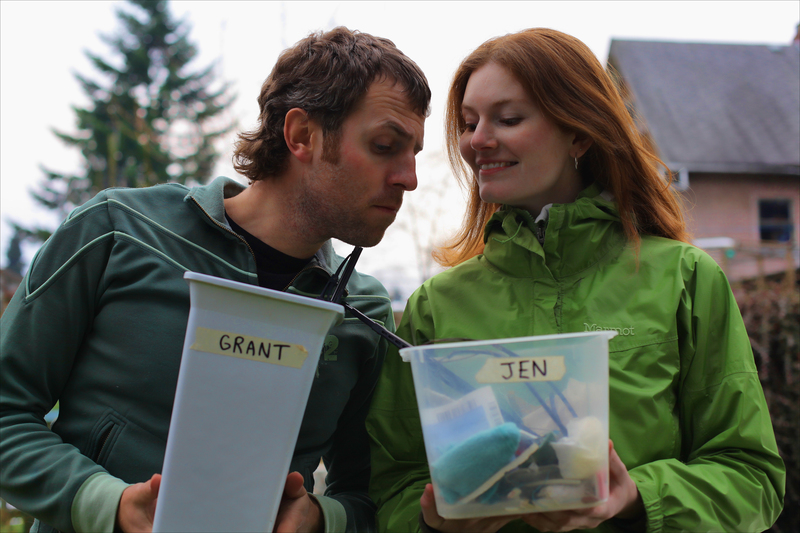 For our 4th and final Thursday night workshop, we’re pleased to present The Clean Bin Project. 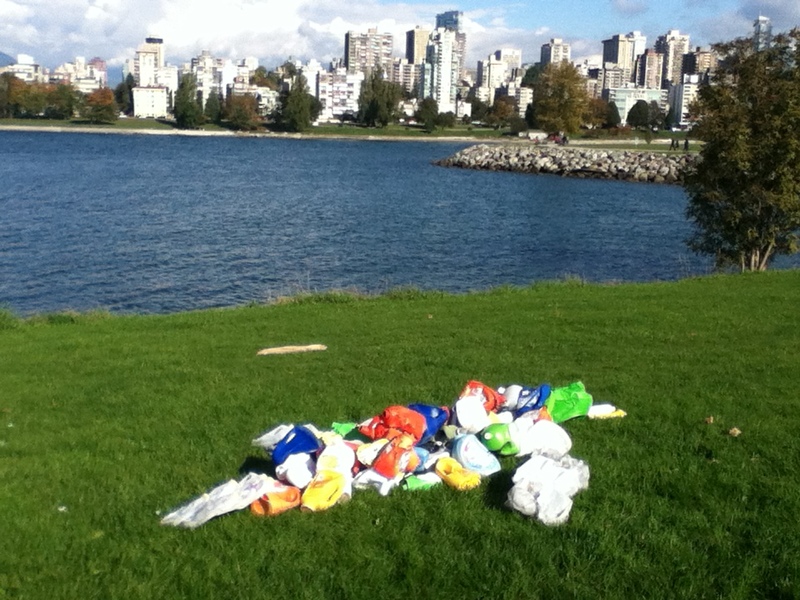 In 2008, Jen got tired of taking out the trash and decided to live waste free. And she learned that sometimes less really is more. Is it possible to live without producing garbage? What are the recycling and reducing options in our area? Come hear practical tips to reduce your household waste, save money, and have fun at the same time. A spatial analyst by trade, Jenny is also a writer, producer, and zero-waster. She is the woman behind the clean bin project blog, and she produced the 2010 film of the same name which documented a year living zero waste. 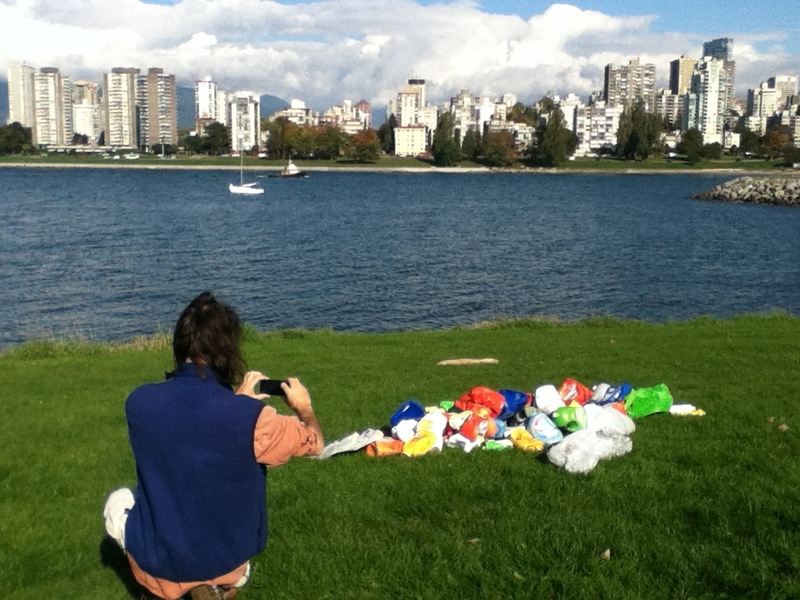 She has spoken around the world on the topic of recycling and waste reduction including a tour across Canada by bicycle with The Clean Bin Project documentary film. Jen spends her fair share of time both in front of and behind the camera, and can be found researching, recycling, and making things from scratch. She’s currently working on her second feature film called Just Eat It. 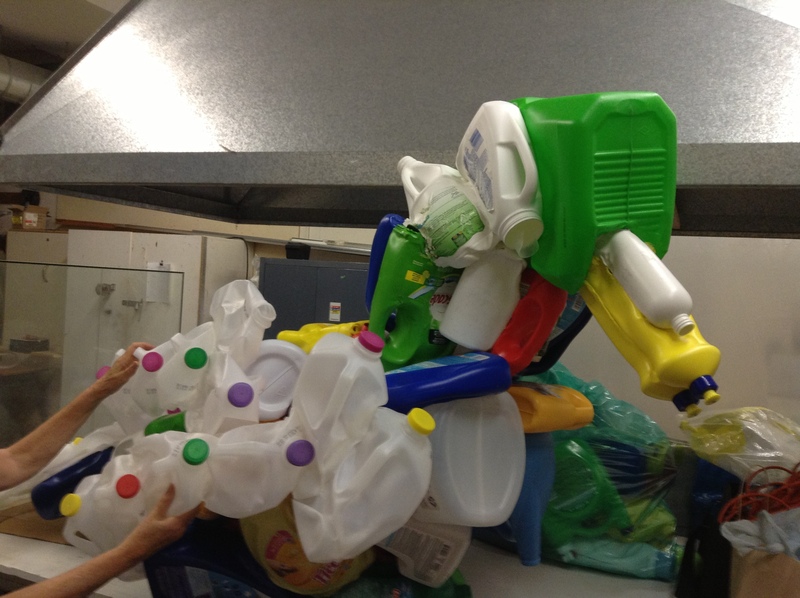 As I become more knowledgeable about plastics recycling, I get more and more questions. 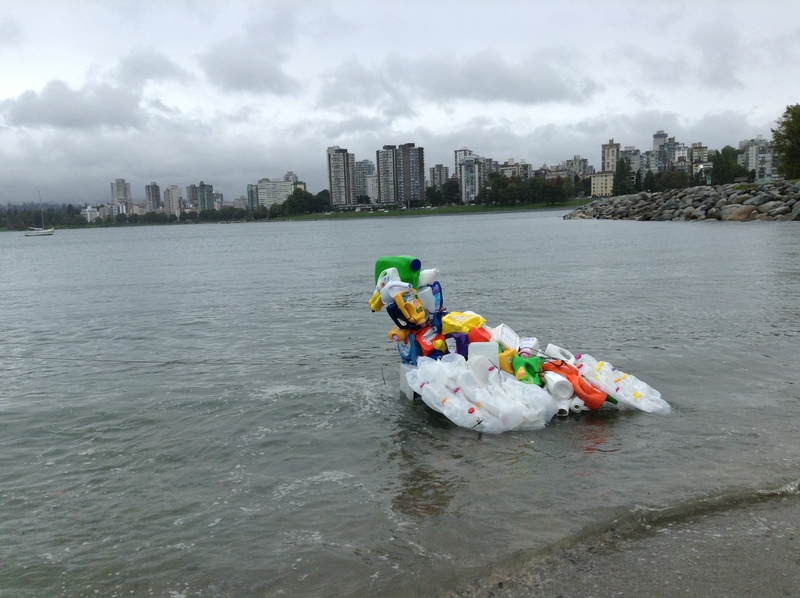 The City of Vancouver has what seems to me a great program, but from roaming around three Wednesdays in a row looking for what kinds of recyclable plastic might be good in bird construction, I notice that we citizens remain more optimistic about the program than what it can actually handle. For instance, my rough estimate is that half of you neatly put the lids back on your containers. Sorry to disappoint you, but the guidelines ask you to remove and throw in the garbage. My question is then: what happens when we don’t? And are the plastic lids recyclable elsewhere? e.g. Pacific Mobile Depots on the third Saturday of each month? Besides the fact the lids are a different kind of plastic and therefore can’t go with the jugs and containers, a good reason to leave off is so that anything left over after you’ve rinsed the containers, dries up and so is less, well, offensive. When searching for milk jugs, my preferred material, I avoid ones that obviously have curdled milk inside, but even the ones that look clean often are pretty high. 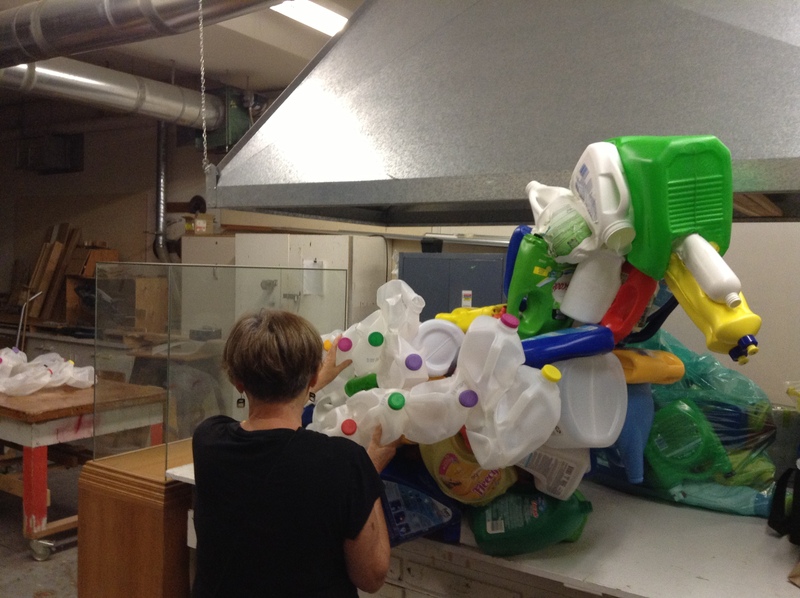 I’m no longer binning, as I have friends and neighbours who are delivering very clean jugs for me to work with. In my neighbourhood, it’s common to see waxed milk cartons and tetra packs in the blue bins and blue boxes. You can recycle these at an Encorp depot, but not through the City bins. Not only do I know this from reading the online instructions, I know it because a walk after pick up shows a lot of cartons beside their upside down bins. I believe that the City can simply refuse to empty the bins at all if it’s got stuff in it that doesn’t follow the rules, but it appears to me that they usually pick up what they can. I’m guessing that a lot of what’s picked up by the truck doesn’t actually get recycled. It isn’t prepared properly or is on the list as not-OK. I empathize with the collectors. My short-lived career as a binner (looking for items that do not have a deposit) made me aware that even very well-intentioned folks make mistakes. For instance, you can only call it well-intentioned to take the extra effort to screw on the lid rather than throw in the garbage, right? 1. how much of what’s collected has to go in the garbage/land fill anyways? 3. I see on Pacific Mobile Depots and City of Toronto websites some mention of the “markets” for recycled plastic and how that affects their operations. 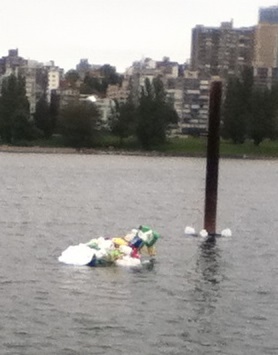 Does the City of Vancouver sometimes collect stuff they can’t get rid of to a recycler? What happens? 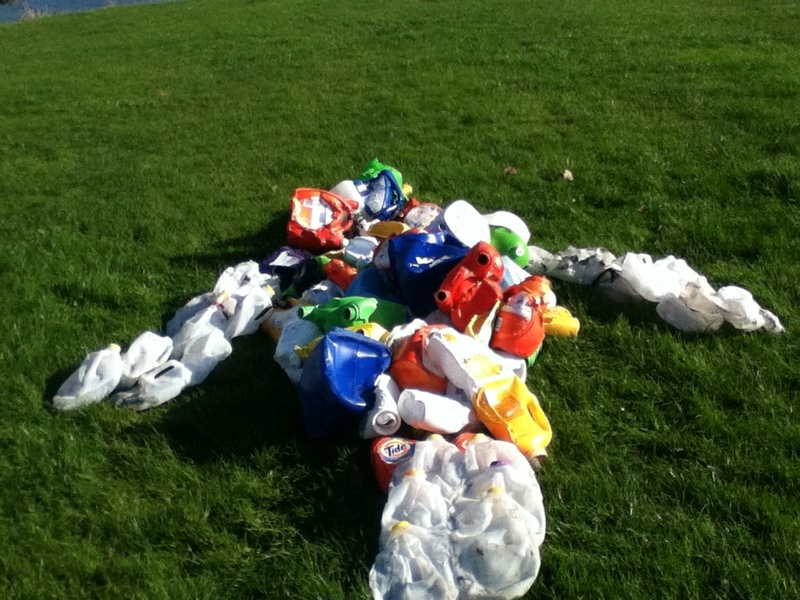 does it stockpile, or, (gasp) head for the landfill. 4. When things change (for example, I was reprimanding people for putting pizza boxes in the bin, but found that’s been OK for a while now), how does the word get out? and how can we citizens help? 5. Finallly, I am wondering if City staff (or volunteers) are available to personally visit groups to answer these kinds of questions. Because admirable though the various online and paper resources are, I’m not actually sure if many of us understand things. My conclusion is that if we all understood more of the why and how, we could do better in our preparation and sorting. 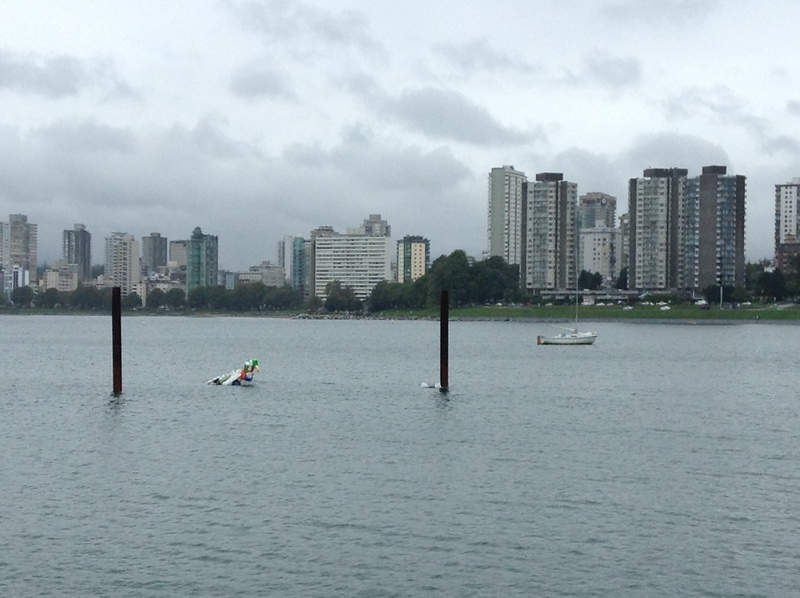 I’m sending a note to the City of Vancouver. You can send them a message about anything too – Same as 311 phoning, but by email. I also sent an email suggesting they encourage email as much as they encorage phone callsto 311. I’ve got to tell you that it’s a bit embarrassing and also on occasion disgusting to be picking plastic out of people’s recycled bins. 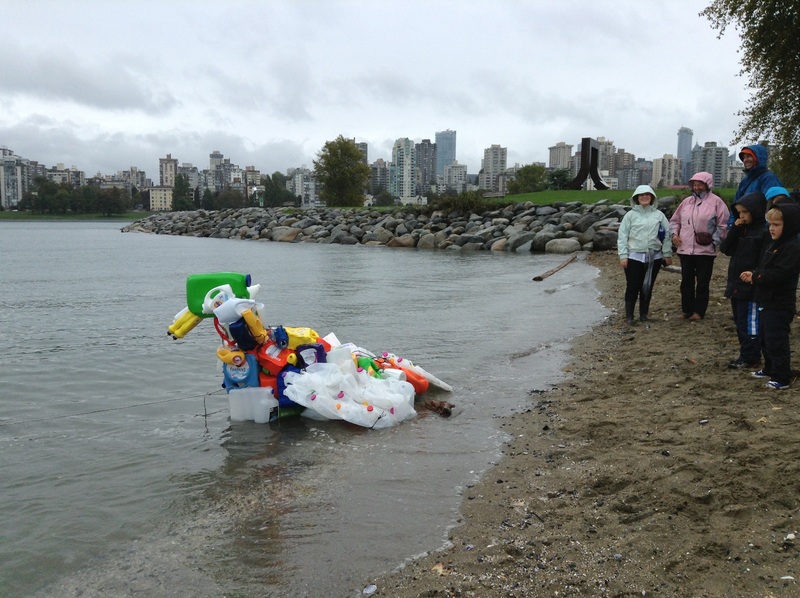 Folks – you’re supposed to WASH the plastic containers. So I thought rather than do that I’d simply try to do some crowd-sourcing. I know that if you know we’re making art fromi it, you’ll wash it clean. We’re making a list of plastics we’ll use in our bird and researching the warnings and issues about each component. Most juice and coffee cup lids are extremely toxic since they fall in the 6 and 7 classes of plastics. As such, one must never heat them or even sip from them. Fortunately, however, there are better alternatives made from Grade 5 polypropelene plastic. All said and done, it goes without saying that the best option is a china or glass cup. … the problem lies in the fact that almost all of them cannot be recycled, and that they can also leach dangerous toxins in the coffee. The plastic lids are made of polystyrene, a Grade 6 plastic which is the denser form of Styrofoam. This component can not only leach harmful chemicals that mimic hormonal action into food, but also increase cancer risk. Biodegradable coffee cups lids are present in the market, but most retailers or coffee shops don’t use them. The best solution in this case is to avoid the lid altogether when you buy your beverage. Another option is to use a reusable stainless steel mug that has a Grade 5 low-leaching and recyclable plastic lid. Have you checked the number on your coffee cup lid recently?